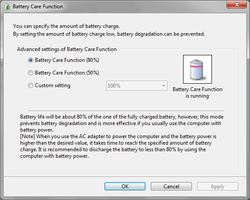 Sony Vaio Battery Care Function utility is a sony vaio utility which helps improve battery performance by limiting maximum capacity to 80% of the full capacity. Read more about Sony Vaio Battery care function in How to Enable Battery care function on Sony Vaio to improve Battery life. Free download the utility attached with this post. It works with only Sony Vaio. I have a Sony Vaio VGN-FZ340E with Windows 7 64-bit. I downloaded the Vaio Control Center from Sony and the Battery Care Utility from you, but the Battery Care Page where I would select the max charge is grayed out. I can't click anything. I restarted, but same thing. Any ideas to get this working? does this software will work with any laptop? This software is designed only for sony vaio laptops. I am not sure if it will work for Dell, Toshiba or other brands. thanks i've been searching for this.